Letting his fancy run wild in On the Origin of Species, the man accustomed to thinking in eons hypothesized “a race of bears being rendered, by natural selection, more and more aquatic in their structure and habits, with larger and larger mouths, till a creature was produced as monstrous as a whale.” Darwin based this speculation on a black bear the fur trader-explorer Samuel Hearne had observed swimming for hours, its mouth wide open, catching insects in the water. If the supply of insects were constant, Darwin thought, and no better-adapted competitors present, such a species could well take shape over time. 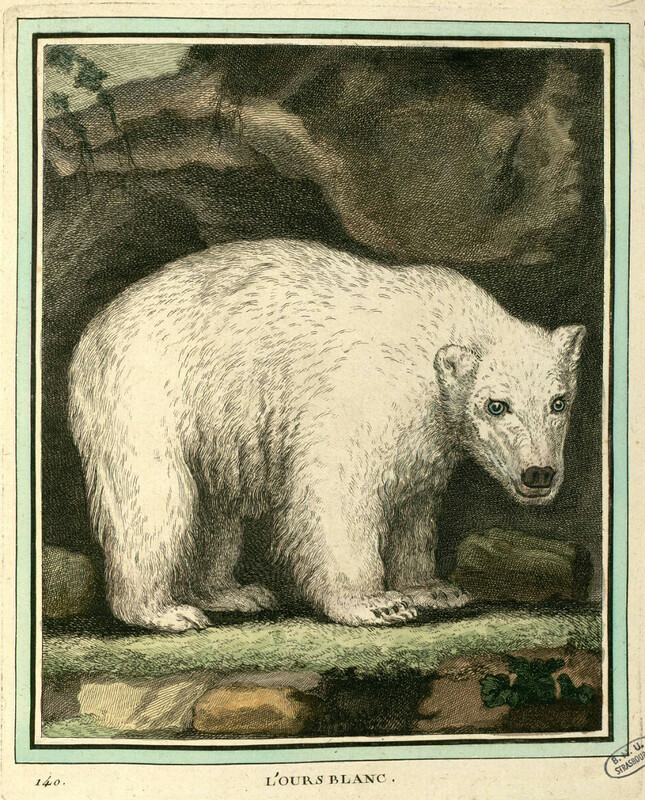 Buffon’s L’ours blanc, the “White Bear”, featured in a 1754 publication of coloured plates used in his Histoire Naturelle — Source. 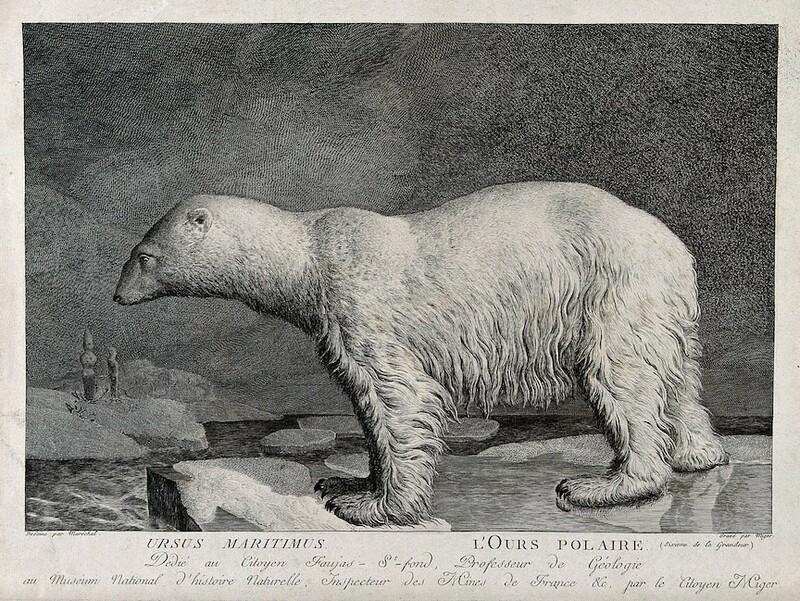 Buffon’s L’ours de mer, the “Sea Bear”, featured in a 1754 publication of coloured plates used in his Histoire Naturelle — Source. the only animal that, by being placed in the coldest climate, grows larger than those that live in the temperate zones. All other species of animated nature diminish as they approach the poles, and seem contracted in their size by the rigours of the ambient atmosphere. . . . In short, all the variations of its figure and its colour seem to proceed from the coldness of the climate where it resides and the nature of the food it is supplied with. 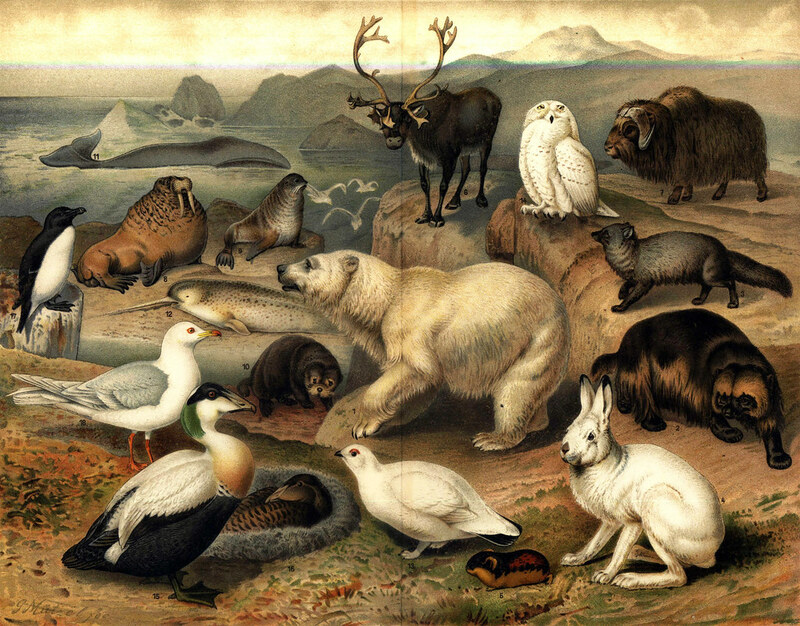 Food availability does play a role in body mass, as does a region’s mean annual temperature, and while polar bears are not the only compact animal thriving in the Arctic, such biogeographic observations anticipated the theory of evolution and principles of ecology. 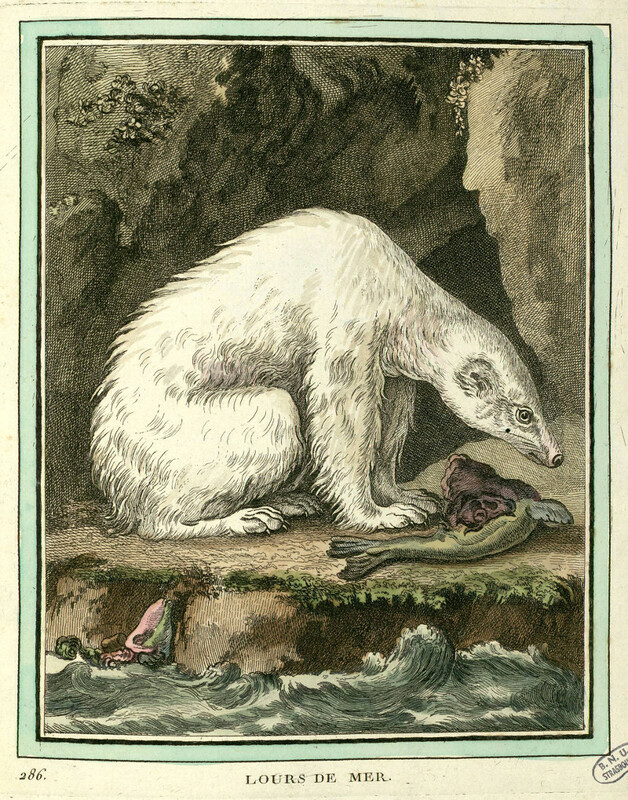 Arctic fauna, by Gustav Mützel. Featured in Alfred Edmund Brehm’s Thierleben (1898), a German encyclopedia — Source. who, finding their means of subsistence running short, and pressed by hunger, ventured on the ice and caught some seals . . . so there is no impossibility in supposing that the brown bears, who by my theory were the progenitors of the present white bears, were accidentally driven over to Greenland and Spitzbergen by storms or currents. The palest brown bears with the greatest amount of external fat, Lamont thought, would have had the best chance to survive and, therefore, reproduce. Upon his return, he wrote to Darwin, whose On the Origin of Species had been published in 1859. Encouraged by Darwin’s response, Lamont elaborated upon walrus and polar bear evolution in his 1861 travelogue, Seasons with the Sea-horses. Darwin approved of Lamont’s hypothesis, and, because Lamont’s thinking on the subject predated the publication of On the Origin of Species, he later credited Lamont (as he did Alfred Russel Wallace) with independently conceiving the theory of natural selection. Etching by S. C. Miger, ca. 1808, after N. Maréchal — Source: Wellcome Library. Polar bear skeletal system. From Richard Owen, On the Anatomy of the Vertebrates (1866). A comparative anatomist and paleontologist who coined the term “dinosaur” Owen supported the theory of evolution but was critical of natural selection as its mechanism — Source. 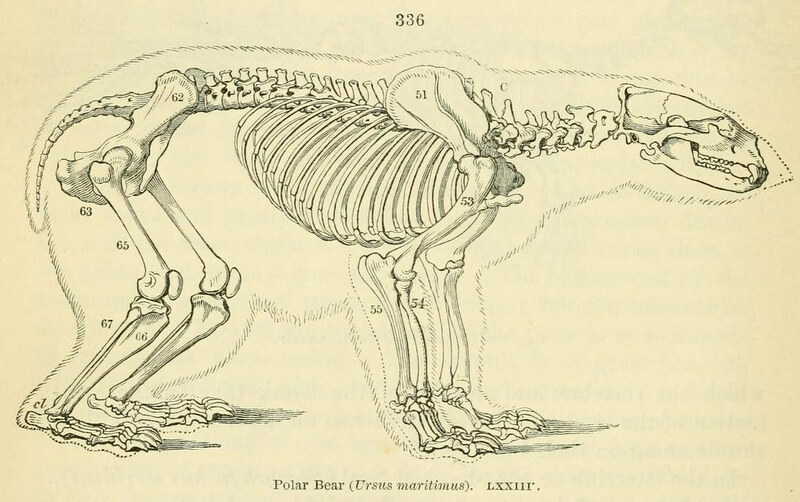 The oldest polar bear fossils found are from Svalbard and northern Norway and have been dated at 115,000–130,000 years old, before the beginning of the last Ice Age. But some biologists think that polar bears and brown bears diverged from their common ancestor as early as 600,000 years ago. According to current research, polar bears evolved from brown bears that ventured onto the frozen ocean to stalk marine mammals, possibly after climate separated them from the main population. This was not a single, clean-cut departure, and repeated pairings between both species have turned the family tree into a thicket. Shrinking sea ice could force polar bears to mingle with their southern cousins again, particularly as the latter now travel farther north. In coastal Arctic Alaska, grizzlies have been observed feasting in the company of polar bears on bowhead whale carcasses. and interbreeding has been documented. After he had been ridiculed for his musings on a future insect-eating cetacean bear, Darwin altered that passage in the second edition of Origin and removed it from subsequent ones. In a letter to the Irish algae specialist William Henry Harvey, Darwin complained how “The Bear case has been well laughed at, & disingenuously distorted by some into my saying that a bear could be converted into a whale”. 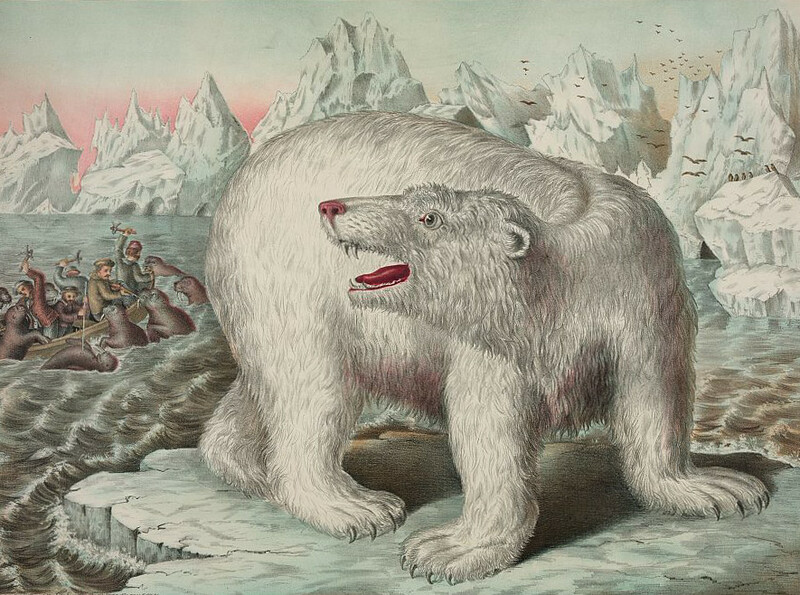 Still, Darwin insisted that “there is no especial difficulty in a Bear’s mouth being enlarged to any degree useful to its changing habits, — no more difficulty than man has found in increasing the crop of the pigeon, by continued selection, until it is literally as big as whole rest of body.” Lamont’s observations and theories as well as later findings about polar bear evolution vindicated the eminent naturalist and his ursine thought experiment. Michael Engelhard is the author of Ice Bear: The Cultural History of an Arctic Icon (University of Washington Press). Trained as an anthropologist, he now lives in Fairbanks, Alaska and works as a wilderness guide in the Arctic. On the Origin of the Species (1859), first edition, by Charles Darwin. Histoire Naturelle (1847–1888), by Georges-Louis Leclerc, Comte de Buffon. Seasons with the Sea-horses; or, Sporting Adventures in the Northern Seas (1861), by James Lamont. A History of the Earth, and Animated Nature (1825), by Oliver Goldsmith. With meticulous research and more than 160 illustrations, Engelhard brings into focus this powerful and elusive animal. Doing so, he delves into the stories we tell about Nature–and about ourselves–hoping for a future in which such tales still matter. With an introduction by Ernst Mayr, this a complete facsimile of the 1859 First Edition of “Origin of Species”.